And of course it’s a gift. I’m sending it this week to my beautiful Ashley, to be enjoyed for the season. I know she will love it! The bag – it’s big! The finished size is about 26 ¾” tall including handles, and 18” wide. Remarkably, there’s something about the physics of its construction that makes it feel like nothing on the shoulder, even when packed with stuff. 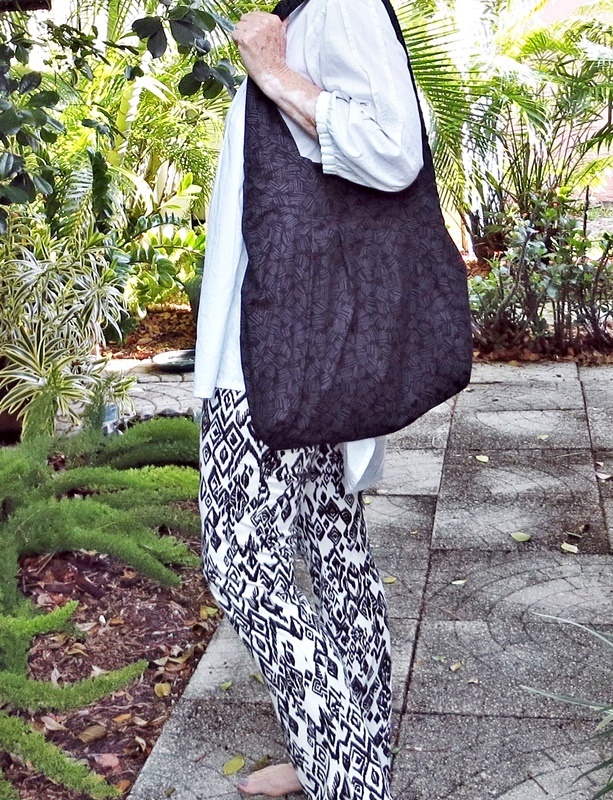 I admit to copying the Amy Butler Birdie Sling (still available online, though not on her site). I simply sought out online photos that gave me clues for the drafting. Loving a challenge, I worked on the pattern and construction for quite a while. 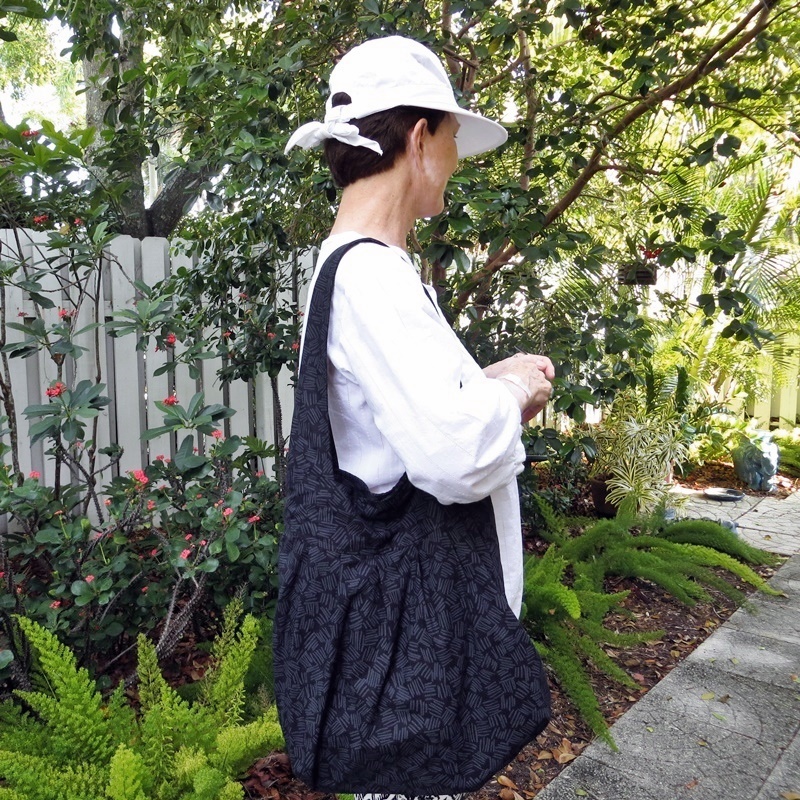 Result – I love this bag! My fabrics are from JoAnnn. One thing they do really well is quilting cottons. 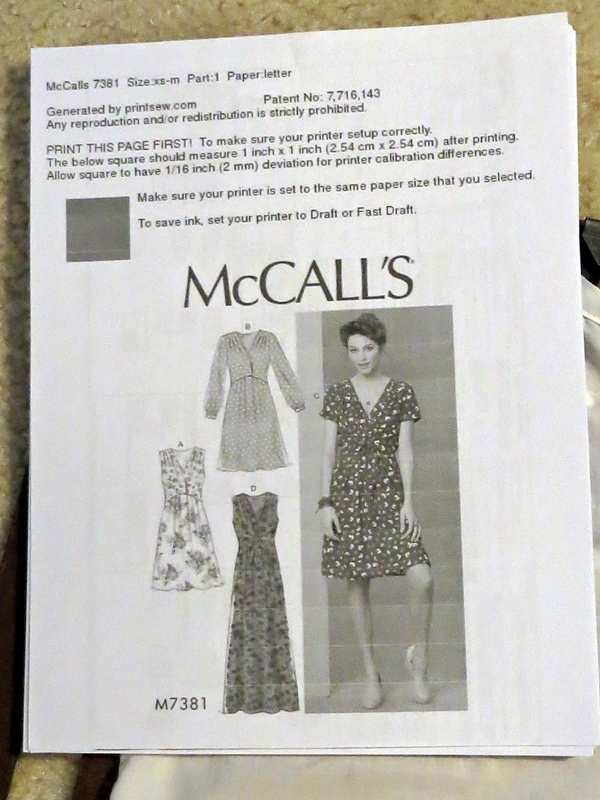 They have the best selection I’ve found for holiday prints, and the fabric is very affordable with a coupon. BTW, their online print inventory is nothing compared to what’s available in the stores. 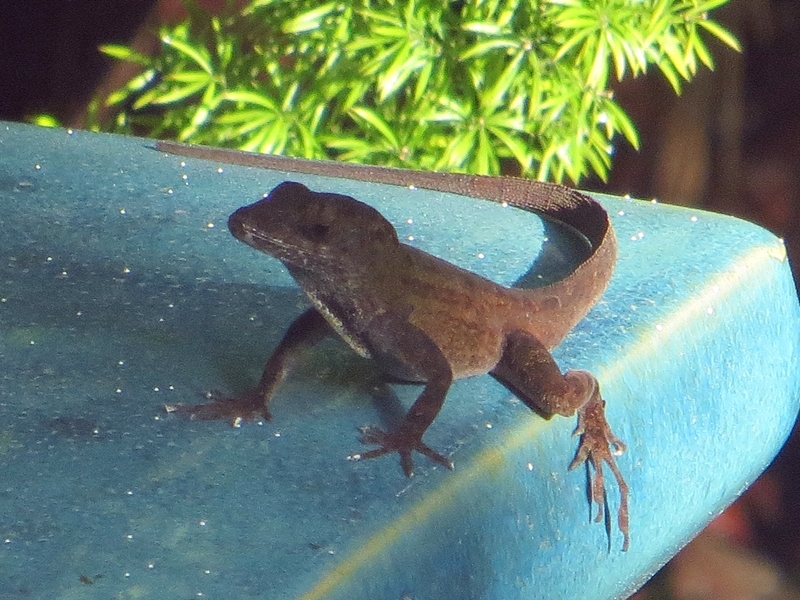 Mr. Lizard was out and about early this morning, king of the garden. He looks so feisty! But it’s been so pleasant. I’ve had the Olympics on the TV all day, and we’ve had thunder storms all afternoon. Very cozy. So – components of the mess in my living room at the moment! I decided to sacrifice my lawn Willow tank and try out my new T-Shirt Graffiti pens. 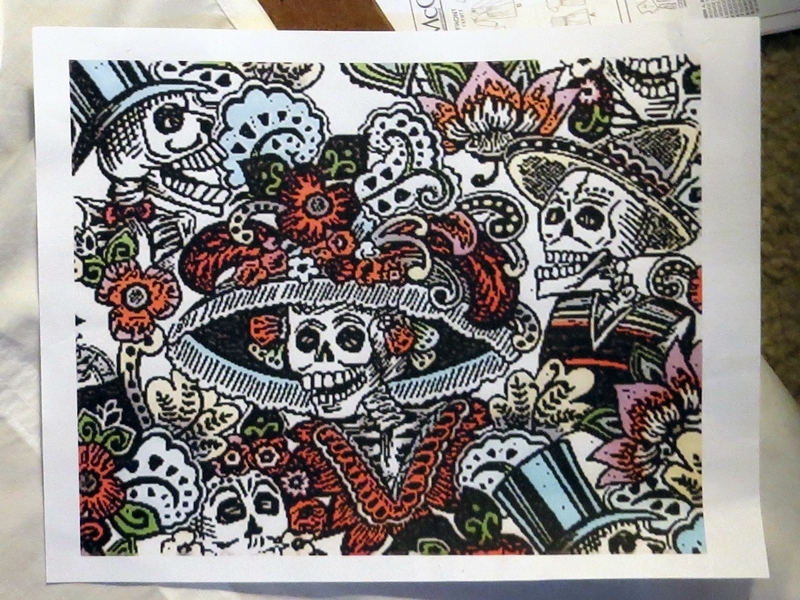 I’m using part of a print from Alexander Henry’s Dia de la Catrina fabric. 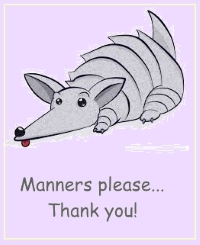 I just downloaded a pic, selected the section I wanted, and used special effects in Paint to accent the lines. Then I printed it and slipped it inside my tank. Oh, and there’s a piece of cardboard in there, too, to guard against bleed-through. 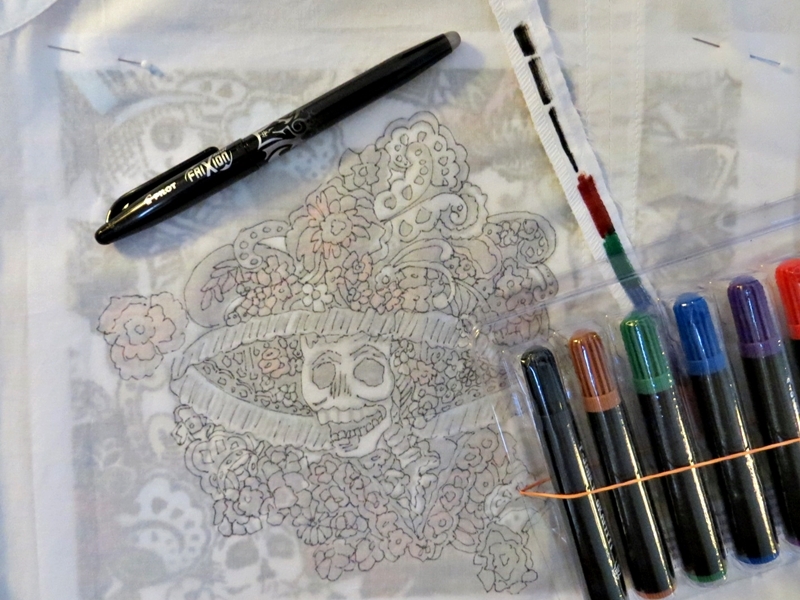 The lawn fabric is sheer enough to make the tracing pretty easy – I used a Frixion pen, just in case I wanted to remove any of the drawing. Using the Graffiti pens has been interesting. I’m not doing a great job, but I’ve learned a lot. And when I’m done, I’ll follow the directions for setting the colors and washing the tank – that’s the real test! If the ink doesn’t run and stays intense, I think I’ll look for pens in other colors – these primary colors are not really my thing. But neat, huh? 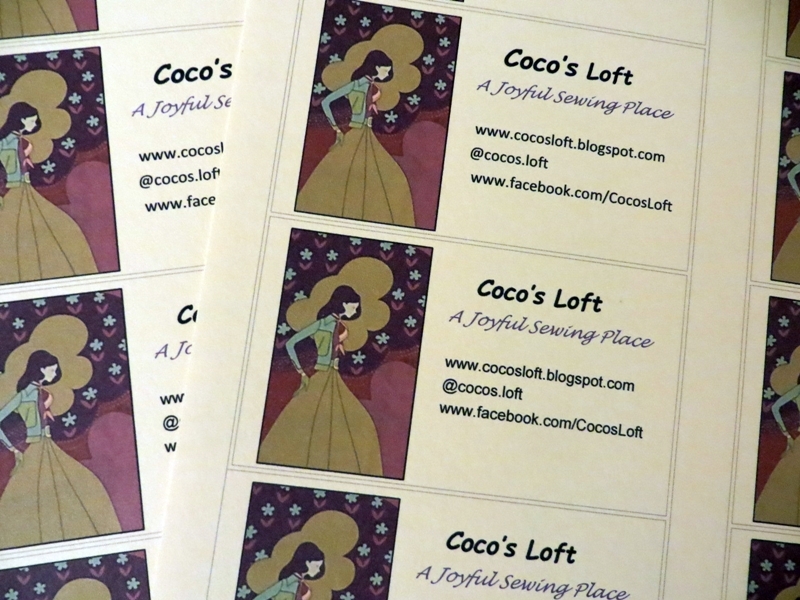 I also designed and printed some ‘business’ cards. Finally. It’s really flattering when someone asks about something I’m wearing, chats with me, and asks if I have a card. Particularly when I’m in fabric or craft stores. I’ve been embarrassed to say ‘no’ and just scribble something on a scrap of paper. 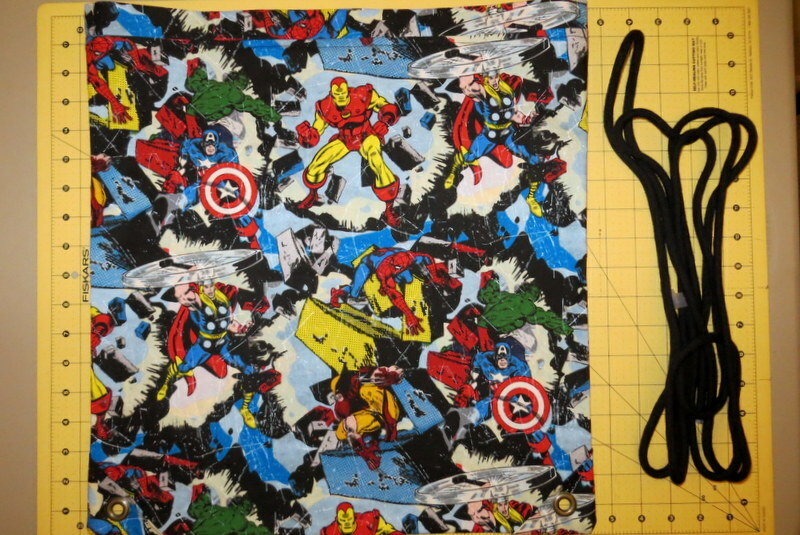 The pic is also from Alexander Henry fabric, the La Strada fabric. It’s the same one I use on my blog, just a different section of the print. And I’ve been making more looper bracelets for David. He has broken a bunch of them – we figured out its the salt in his pool and in the ocean (the loops are silicone). Football season is around the corner, and he really wanted the Florida Gator version. Gosh, it made me feel so good when he asked for more. 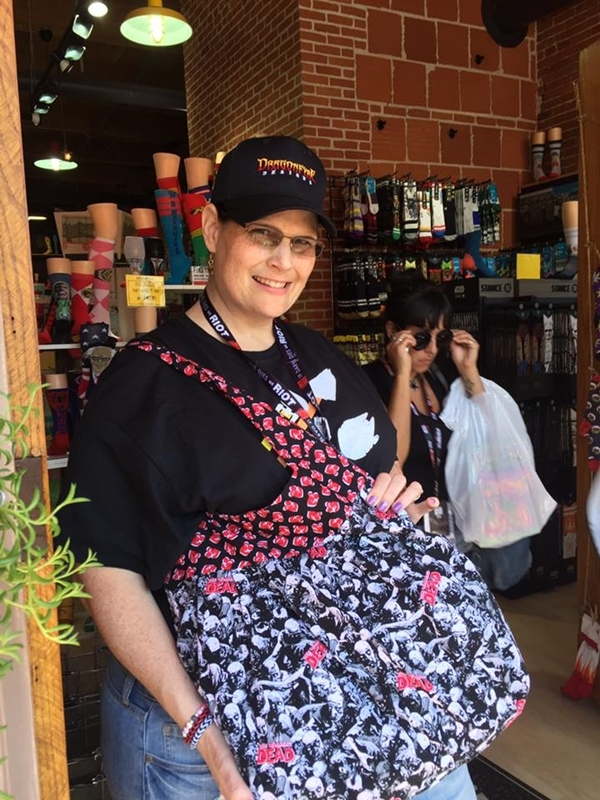 Parting shot: Here’s my girl at the San Diego Comic Con, with her Walking Dead sling bag in action! 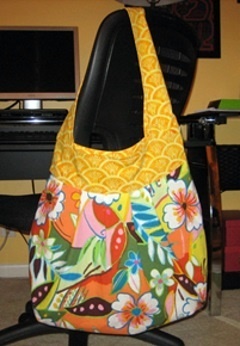 Summertime tote bag – a big one! It’s Memorial Day, the official flip into summer. 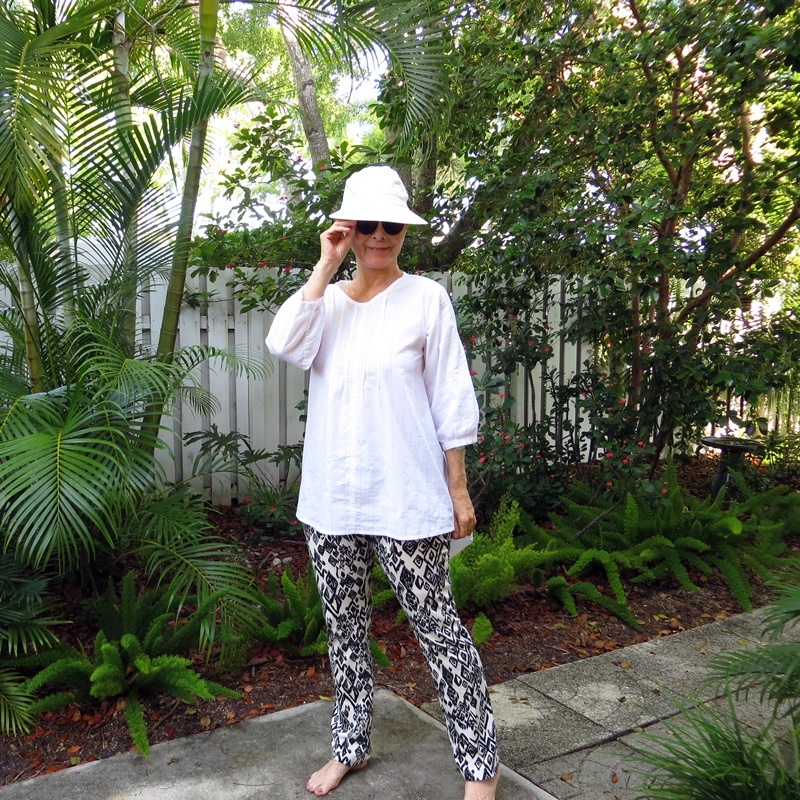 But summertime always starts early in Florida – it has been hot hot hot and humid. And the last thing I want to do is carry a leather handbag with all its metal zippers and whatnot’s. Too much! 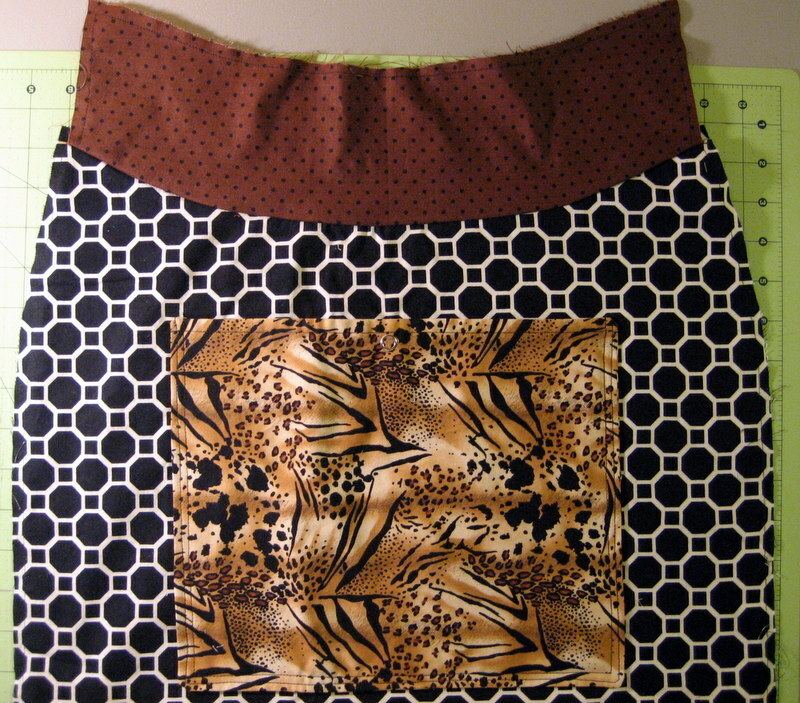 Solution – a fabric bag. 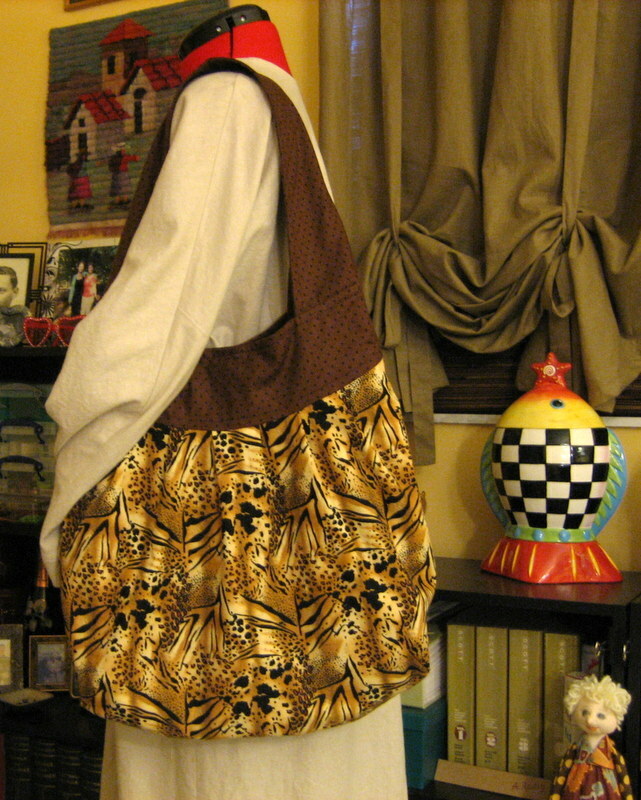 About five years ago I drafted a tote bag pattern, very much based on the Amy Butler Birdie Sling. There are a ton of inspiration pics of the Birdie Sling on the web, and lots of tutorials as well. So drafting my version was pretty easy. I’ve made over 20 of these bags. They were both gifted and sold, back when Ashley and I were doing the craft fair circuit. But I still have and use the first one I made. I love it. It’s roomy, about 26 ¾” tall, including the handles, and 18” wide, and it has some incredible physics going on. Load it up, and the weight is barely felt on one’s shoulder. Seriously! I’m sure it has something to do with the inside bag hanging freely from the top band. Whatever it is, I’m amazed every time I use it. 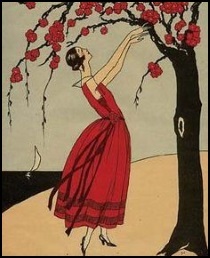 I don’t know if that is characteristic of the AButler bag as well, but I’d be interested to know. BTW, this one has been through the laundry several times. Yes! machine wash and dry. Time to make some more. 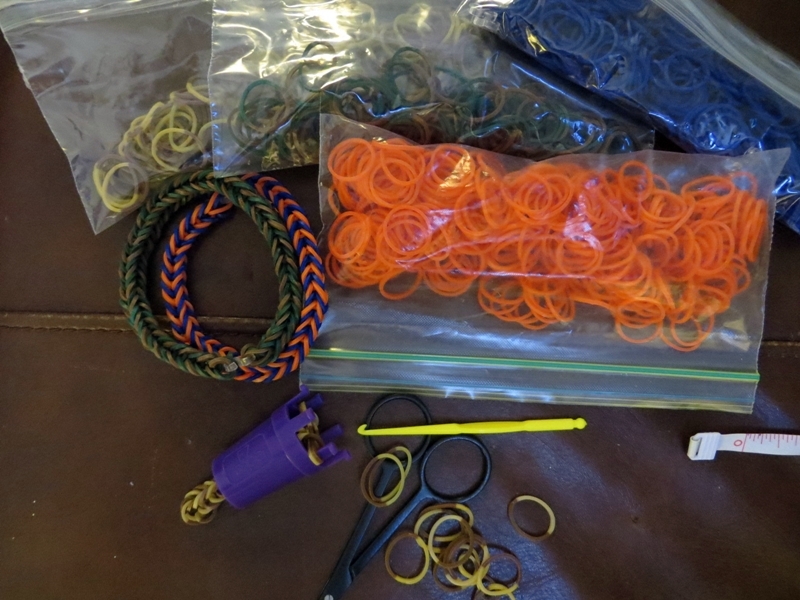 It’s a great way to use remnants, since each piece – shell, inside bag, bands/handle – uses a yard or less of fabric. Calico, quilting cotton, and light canvas all work well. 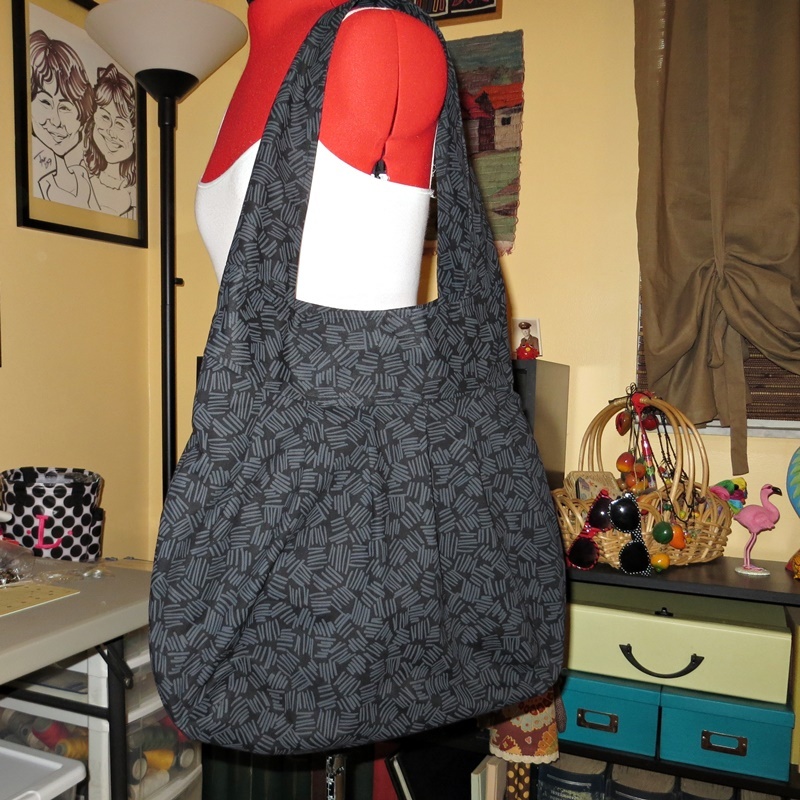 This cute black/grey number is the first one I’ve done without contrast fabric on the bands and handle. And it works perfectly with just about everything in my closet. And the other is zipped – a catch-all for lip balm, nail file, comb, tissue, the jewelry I take off when it bugs me… I used a purple zipper because it’s easier to see than a black one would be. And I’ll put helper of some kind – a ribbon or charm – on the pull. 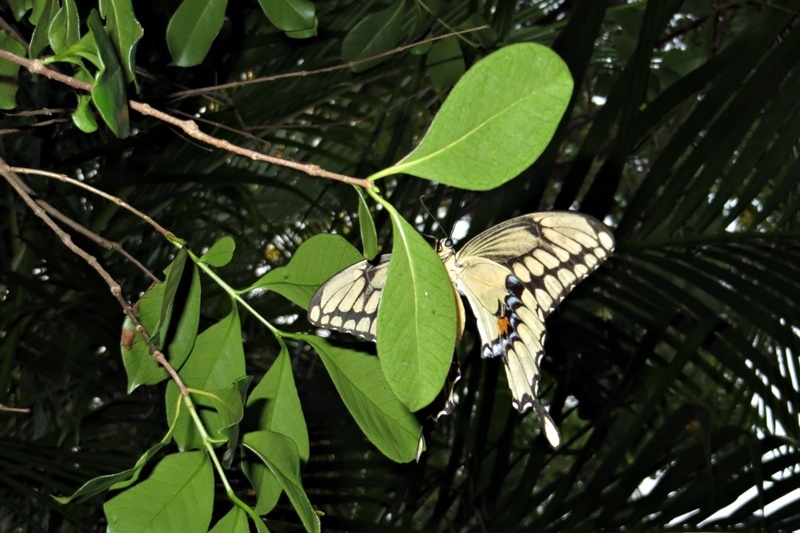 Parting shot: Zebra butterflies and a giant swallowtail roosting in the guava tree at sunset a couple days ago. They’re in the tree almost every night now, just six feet from my porch. Beautiful. 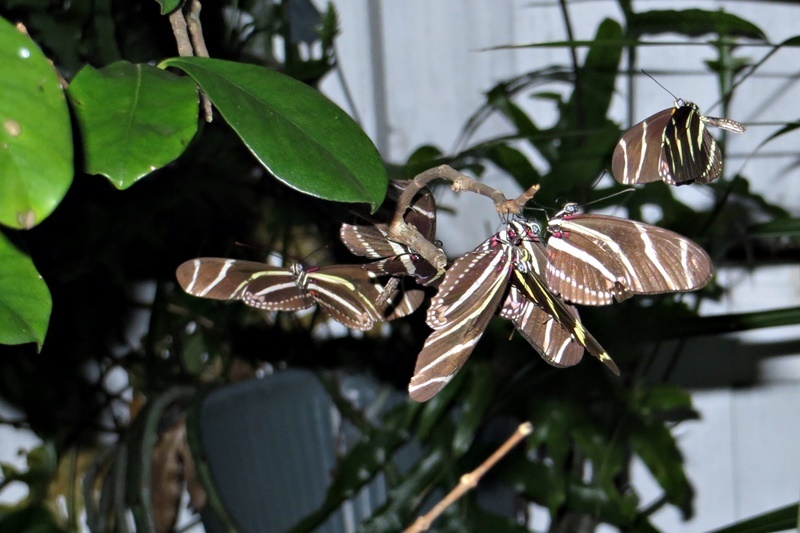 This little guy is not so little – 5″ wing span! My daughter and her companion are heading out to San Diego for the big Comic-Con on the 16th – I just had to make something for the trip. 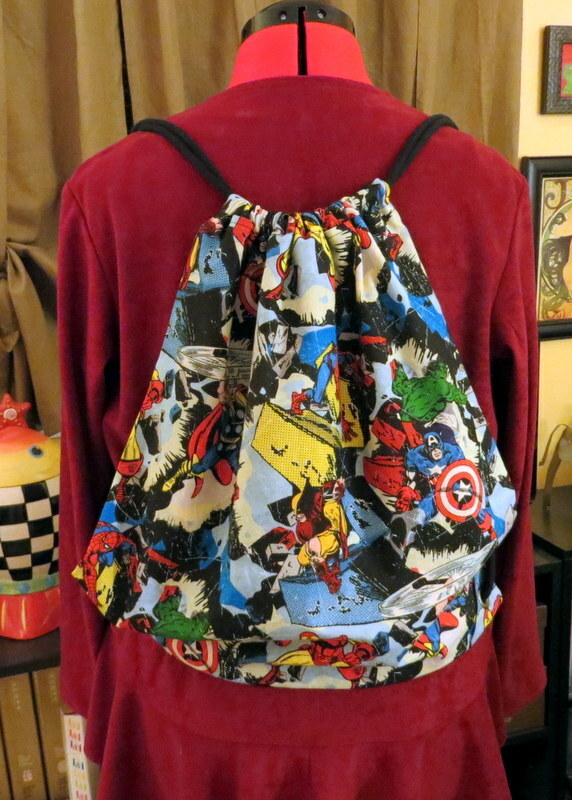 How about matching drawstring backpacks using Marvel action hero fabric. Really neat! The San Diego Comic-Con is in its 44th year and is the country’s longest continuously run comics and popular art convention. DD and DDC (my acronym for dear daughter’s companion 🙂 go to comic-cons all over the country, are very immersed in the pop culture and collecting scene, and have wonderful friends everywhere. It has opened a whole new world for me as well, I love the art and fantasy. 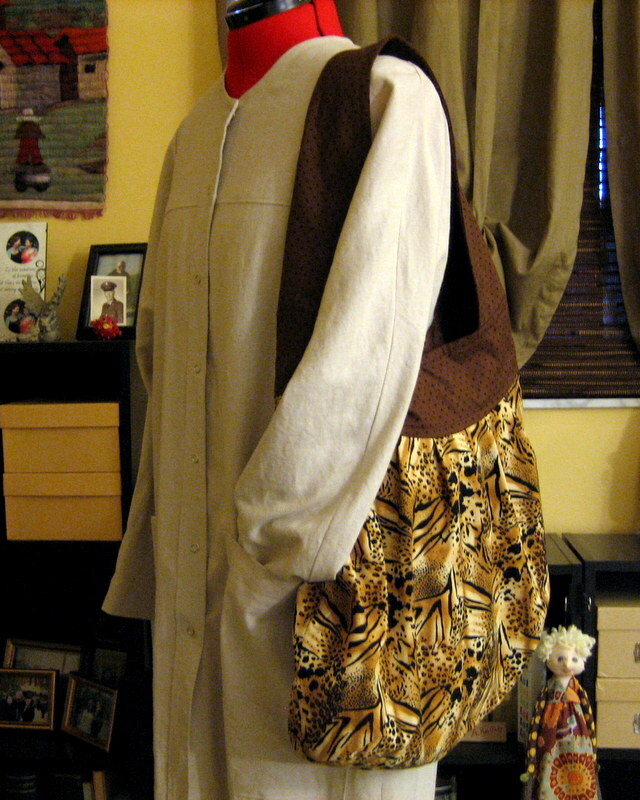 The backpack – I started with a free pattern and tutorial by Debbie Colgrove on about.com. 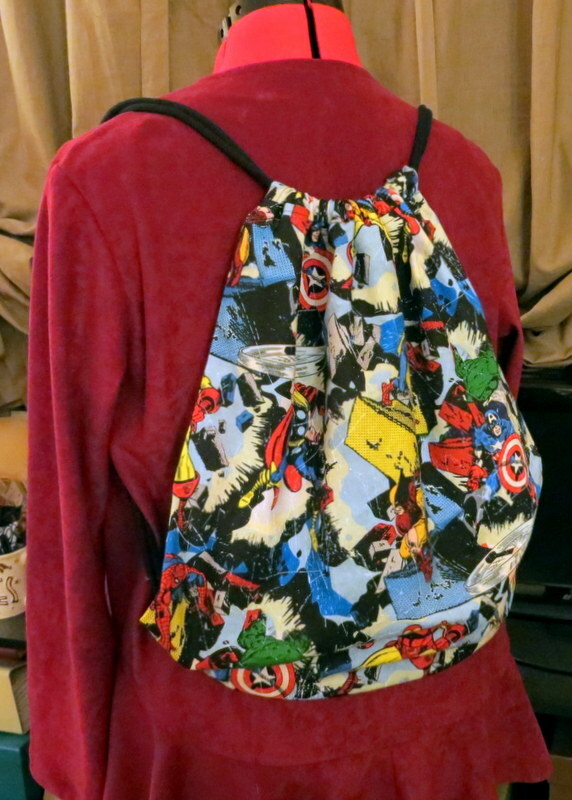 I liked Debbie’s pattern because (1) it has doubled reinforcement on both sides of the bottom corners, where the grommets are attached, and (2) the drawstring casing at the top of the backpack is constructed separately and attached to the bag. The result is a very sturdy backpack. Who knows what will jump in there! 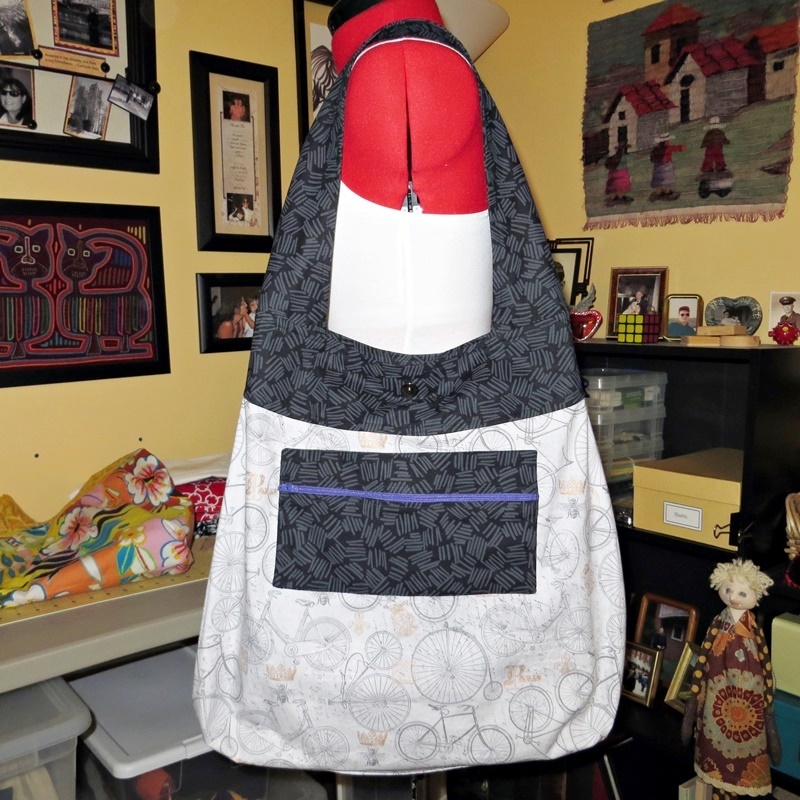 Here’s a look at a completed backpack before cording. 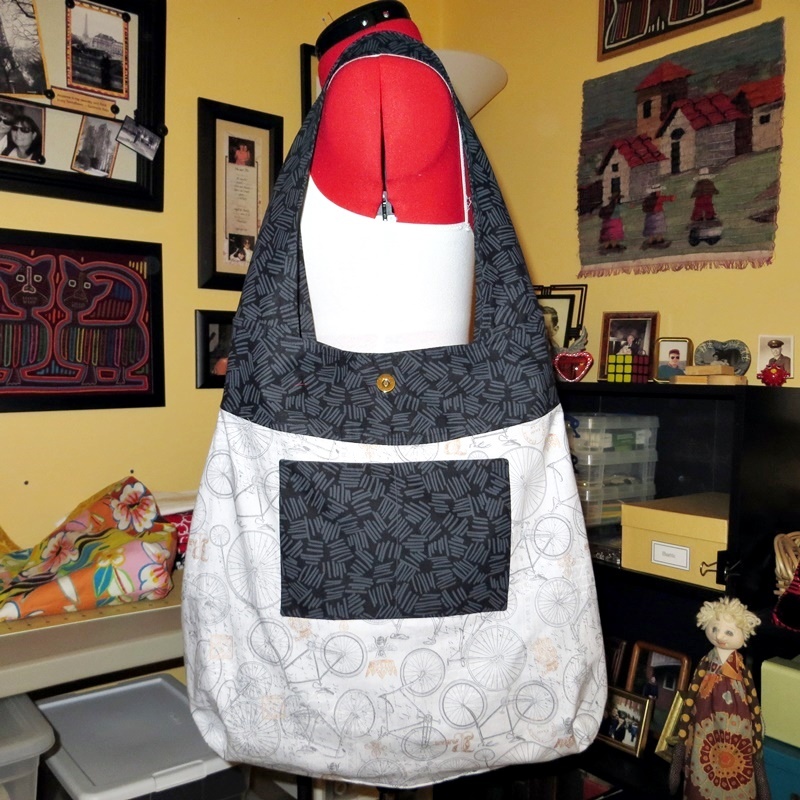 The finished size is 17″ wide x 18″ long, which is a bit larger than the pattern – I wanted a roomy bag. I’ve never done big grommets before, only little eyelets. 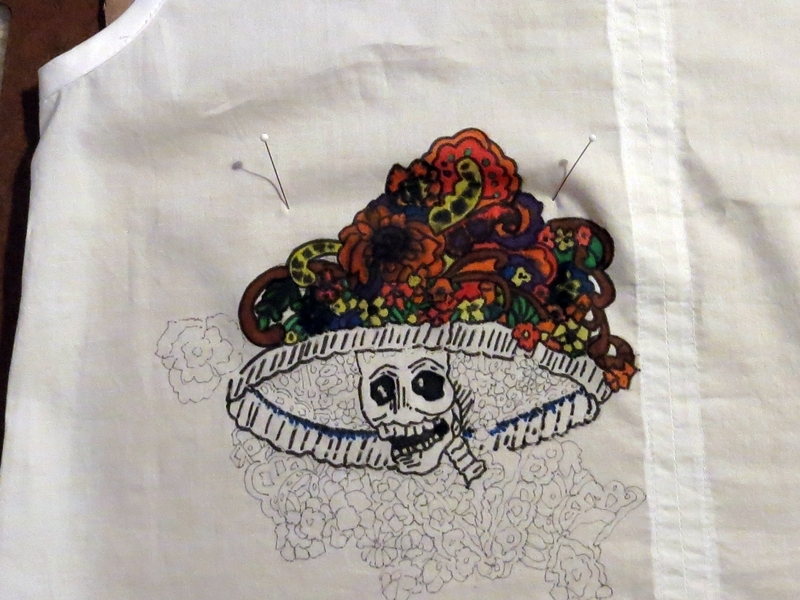 These really test your bravery…all that sewing and it comes down to putting a big hole through your work. I had tools on hand for this project, since I attach gripper snaps to garments fairly often. 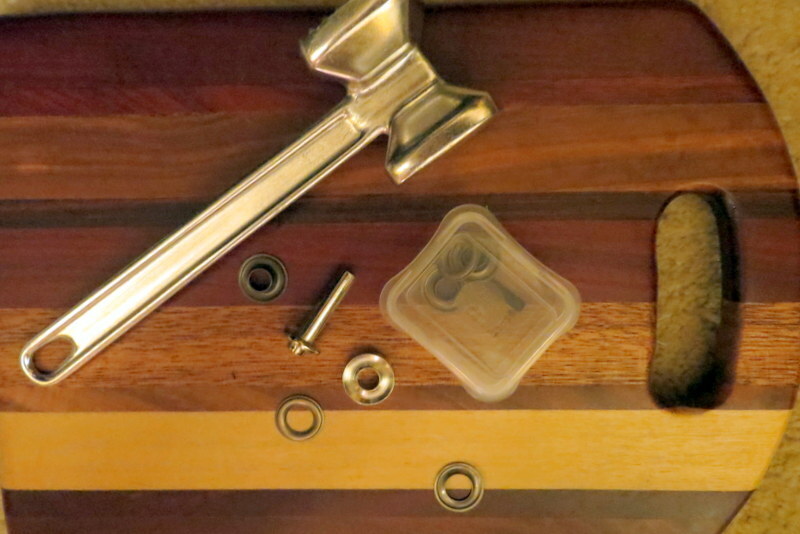 The 3/8″ grommets were easy to find. My tool kit includes a Costa Rican hardwood bread board and a meat tenderizer. 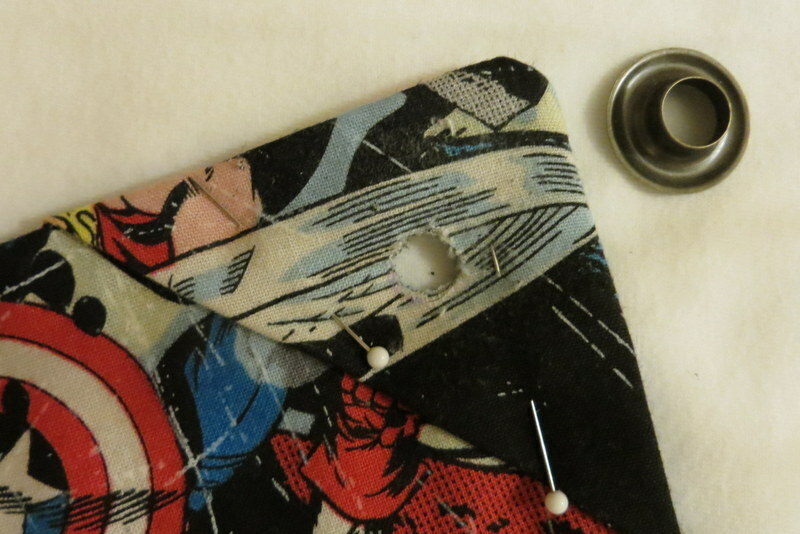 The large, flat side of the latter is wonderful for setting snaps and, now, grommets! 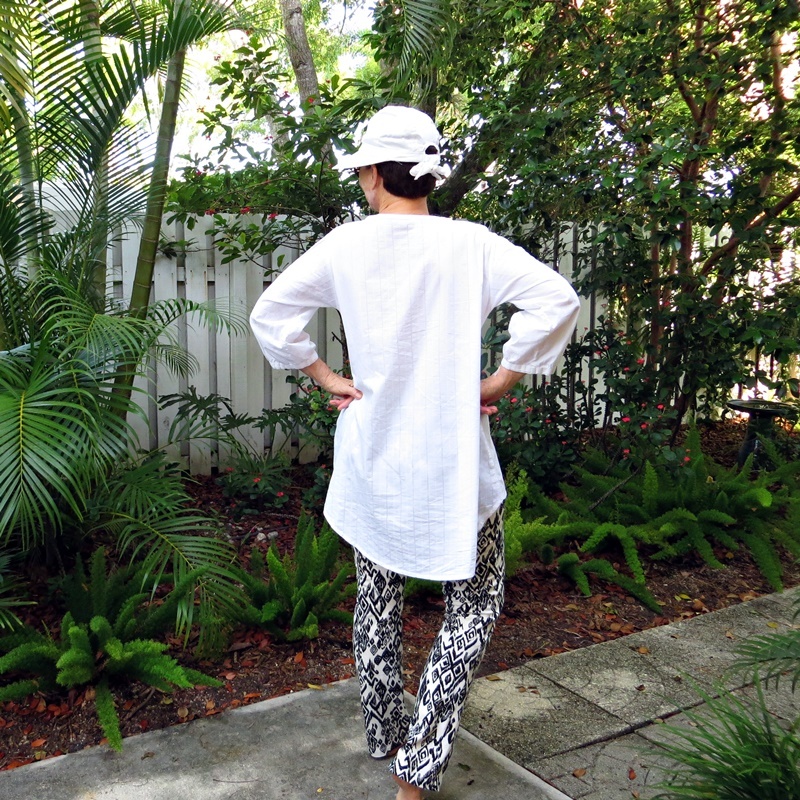 Jungle January # 1 – a Jungle Bag! 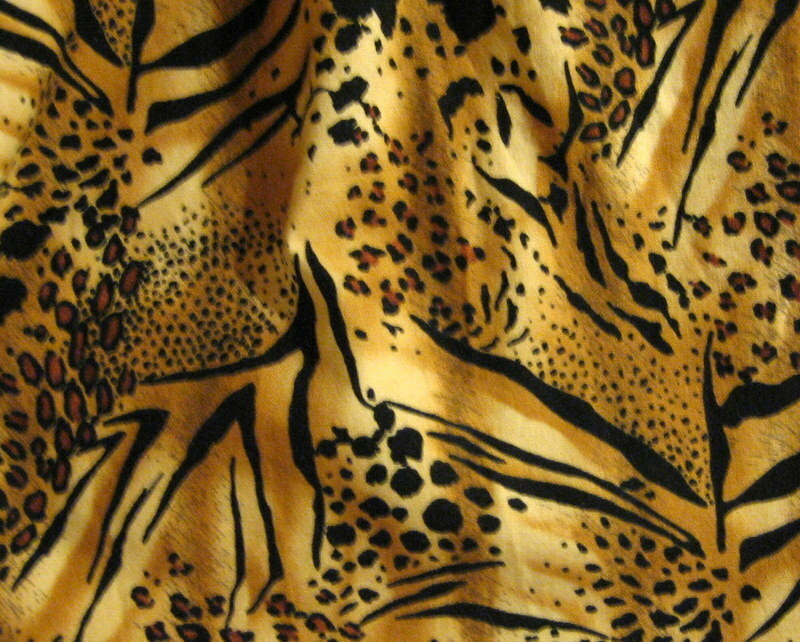 As Prttynpnk has reminded us, it’s time to bring the Jungle January prints out to play! I love this bag, this makes number four just for me! 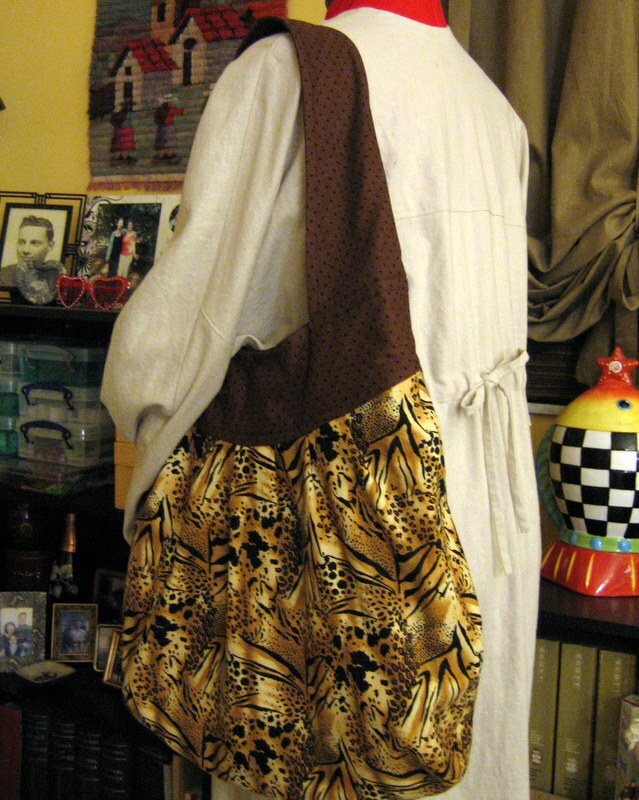 But a major sharing of kudos – although I drafted my own pattern, the bag is inspired by Amy Butler’s Birdie Sling. This is a roomy bag! From the bottom to the top of the strap is 28″, and the width of the bag is 18″. It’s really comfy because it fits right up under the elbow/upper arm area. It feels secure, and the front strap is a nice handhold. The shell has 5 pleats on each side and a deeply rounded gusset bottom. Not seen in the photos, there is a 3/4″ magnetic closure centered about an inch below the top opening. The lining has no pleats – but does have two pockets, one of which is quite large and has a snap to snug it up. Out of view, every piece of the bag has a sewn woven interlining (not fusible interfacing). I’ve found that interlining a tote really helps it keep its shape and bear the weight of all those things we just have to have 🙂 My favorite fabric for interlining these bags – recycled sheets! A final note on the design – Amy Butler worked some magic with this bag. I’m sure some physics are involved (bird on a wire?) because fully loaded, this bag feels like a featherweight. So weird and wonderful! 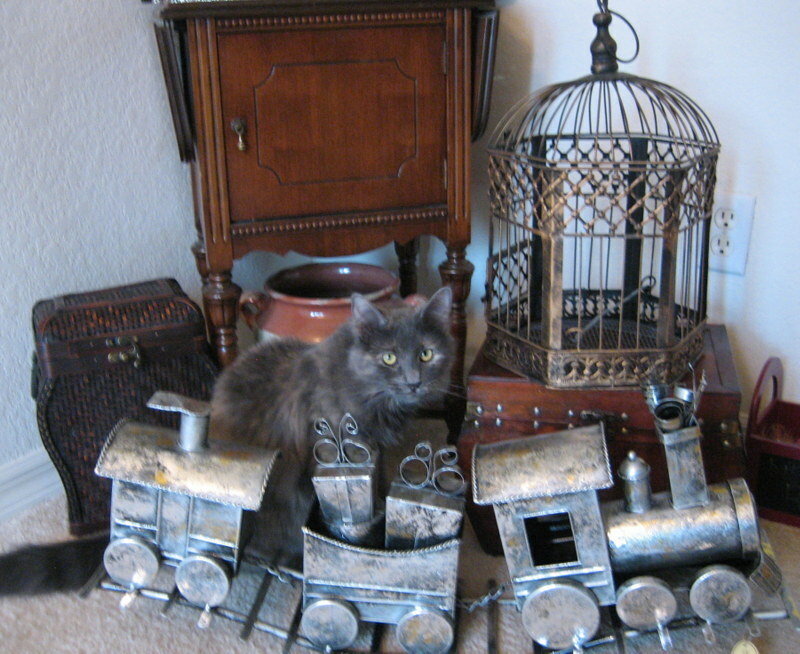 I’m off to prowl for fabric and leave you with Nikita the stealth kitty. She looks soooo guilty.